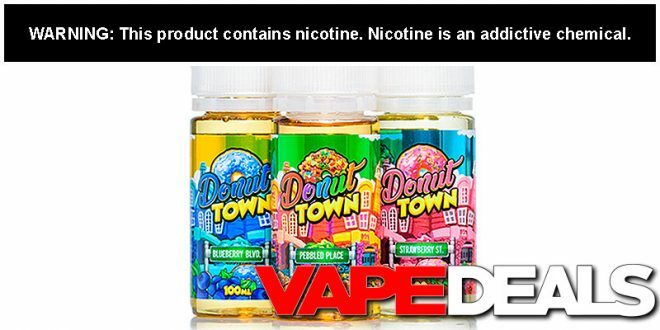 Here’s a nice deal for fans of Donut Town e-liquid. You can pick up a 3 pack bundle of each flavor profile (Blueberry Boulevard, Pebbled Place and Strawberry Street) for just $20. That’s 3 100mL bottles for a total of 300mL at just $20. Not a bad deal if donut juices are your thing. Blueberry Boulevard – A Blueberry covered donut with a touch of icing that you will not want to put down! Pebbled Place – A Fruit Cereal covered donut with a touch of icing that you will not want to put down! Strawberry Street – A Strawberry covered donut with a touch of icing that you will not want to put down!